Pre-raphaelite artist Edward Burne-Jones was fascinated with two mythic subjects: Sleeping Beauty and the Days of Creation. He revisited subjects over and over spanning a period of decades and across several media: in oil and gouache, and in designs for stained glass, tile. The Days of Creation, done in oil and gouache and gold paint is considered one of his greatest works. Nearly all mythologies have a creation story, one that tells us where humankind comes from and lays the scene for our place in the world. When this plays out in art, it can be particularly fascinating. Burne-Jones Days of Creation painting has a colorful history, one with bigger-than-life friends, their children. It is a story with crime and mystery, and a hero’s journey of getting back to wholeness and completeness. In 1870, Burne-Jones designed six stained glass windows for Morris & Co.; these were installed in the west window of All Saints Church. This was very early in a period during which Burne-Jones withdrew from exhibition, a period that would last seven years. Days of Creation designs were thereafter executed in stained glass, in oil, gouache and gold paint. Additionally,. cartoons were made for tile. Morris and Co. later created tiles based on the original cartoons, but those executions differ considerably from the original designs and appear to have been derived more from the stained glass implementation as an intermediary step. A later ceramic version made by Morris & Co ceramic workshops in Birkenhead for the Dyfrig Chapel at Llandaff Cathedral, Cardiff, was completed after Burne-Jones’s death in 1898 by Harold Rathbone. In 1871,Burne-Jones began work on a study for the Days of Creation oil and gouache panels. He worked on the angels off and on through 1876. The series consists of six panels, one for each day, with an angel at rest seated at the bottom of the sixth panel for the seventh day. Jenny, William Morris’s elder daughter who was 15 at the time the series was completed, was the primary model for the angels, although her younger sister, May, also appears in some panels. The last of the Days of Creation panels was completed in 1876, the same year that Jenny’s life was changed forever when her health began to deteriorate giving way more and more to epileptic seizures. Jenny and her father were very close; Jenny had just passed her Cambridge Local examinations and would most likely have attended one of the women’s colleges at either Oxford or Cambridge, had her health permitted it. Each angel panel is approximately 42 inches. 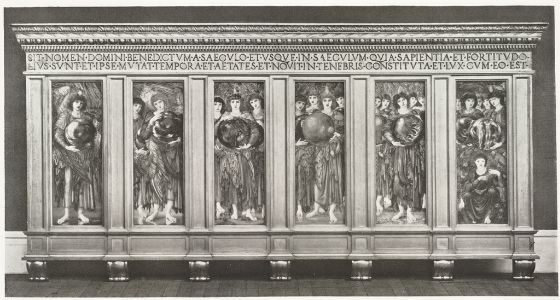 A custom frame was designed by Burne-Jones specifically to hold all six angels. The next picture is divided into six compartments, each representing a day in the Creation of the World, under the symbol of an angel holding a crystal globe, within which is shown the work of a day. In the first compartment stands the lonely angel of the First Day, and within the crystal ball Light is being separated from Darkness. In the fourth compartment are four angels, and the crystal glows like a heated opal, for within it the creation of the Sun, Moon, and Stars is passing; the number of the angels increases, and the colours grow more vivid till we reach the sixth compartment, which shines afar off like a rainbow. Within it are the six angels of the Creation, each holding its crystal ball; and within the crystal of the sixth angel one can see Adam’s strong brown limbs and hero form, and the pale, beautiful body of Eve. At the feet also of these six winged messengers of the Creator is sitting the angel of the Seventh Day, who on a harp of gold is singing the glories of that coming day which we have not yet seen. The faces of the angels are pale and oval-shaped, in their eyes is the light of Wisdom and Love, and their lips seem as if they would speak to us; and strength and beauty are in their wings. They stand with naked feet, some on shell-strewn sands whereon tide has never washed nor storm broken, others it seems on pools of water, others on strange flowers; and their hair is like the bright glory round a saint’s head. *The Fourth Day was cut from its frame during a dinner party in Dunster House at Harvard University in 1970 where the entire series on loan from the Fogg Art Museum. It has never been recovered. The restored fourth angel is derived from black and white platinotypes done by Frederick Hollyer at the end of the nineteenth century, 1934 photos from the Harvard Art Museums archives, and extrapolated from the description of Oscar Wilde and other critics of the day.